Fresh Fruits & Vegetables Are Here! 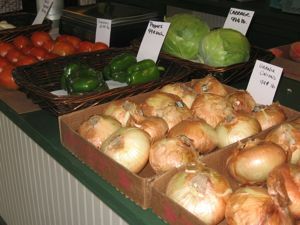 Now is a great time to enjoy the delicious taste of locally grown produce and area fruit. 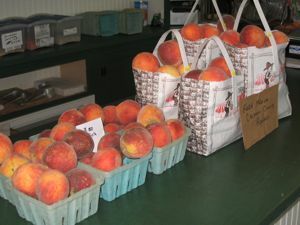 Visit either location to enjoy farm fresh produce and delicious peaches picked up weekly from Calhoun County. Melons are now ripe and make for the perfect addition to your meal. 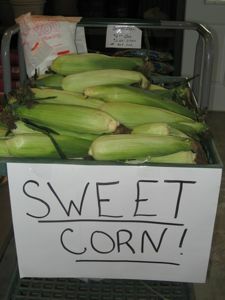 Sweet corn is picked daily from area fields. We also grow peppers, green beans, tomatoes, cabbage, cucumbers, white eggplant and more. 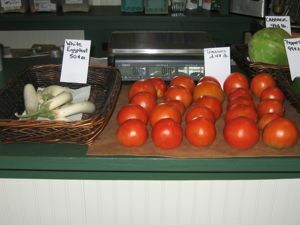 Be sure to visit throughout summer and fall as more produce becomes available. We will also have apples and fresh cider in the fall. Brenda & Bob Conn invite you to visit their greenhouse in Petersburg and on Rt. 78, five miles north of Virginia. Their business began 22 years ago and the owners do what they enjoy best: providing fresh plants, flowers and full-service to their customers. Their plants are all grown in their greenhouses and are always fresh. They offer annuals, perennials, roses, shrubs, hanging baskets and vegetables. They also sell fresh fruit and produce in season. Their beautiful store in Petersburg has a wide selection of baskets, grave saddles, cement statuaries and seasonal items. They even sell fresh, locally made jellies. Their greenhouses offer one-stop-shopping for all of your flower and garden needs. They offer potting soil, fertilizers, insecticides, seeds, sprayers, garden tools and everything you’ll need for beautiful flowers and bountiful gardens. They also offer what the chain stores can’t: friendly, knowledgable and free advice. They can also provide a wealth of information about all things related to plants, flowers, planting instructions and so much more. Now is a great time to shop and get all of your home and garden needs. Please check out our website to take advantage of seasonal specials, sale prices, punch cards and special events. Visit our slideshows and photo albums to check out the store, the greenhouse and see samples of our work. You’ll also find useful links to top seed companies and instructional videos. For more information, please stop by either location or call us at (217) 452-3381. We are a member of the Petersburg Chamber of Commerce. Our Petersburg hours are 9:00 am - 6:00 pm, seven days a week from April 1 through Christmas. Home Grown - Always Fresh We are growers of over 400 varieties of perennials, 550 varieties of annuals, 150 varieties of vegetables, 40 kinds of herbs, rose bushes, flowering vines and ornamental grasses. Our mission is simple: To provide the best quality, locally grown plants with great customer service. Now is the perfect time to pick out your plants, fertilizers, potting soil and anything you need to beautify your home or plant your garden.